Home / About Us / Meet Our Physicians / James Walsh, D.O. 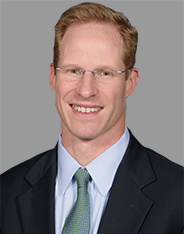 Dr. James H. Walsh is a graduate from the University of New England and completed his residency at the Cleveland Clinic. After completing his orthopaedic surgery residency at the Cleveland Clinic he served three years as a staff orthopaedic surgeon in the United States Air Force at Langley Air Force Base, Hampton VA. During his time in the USAF he served six months as a wartime deployed orthopaedic surgeon in Operation Enduring Freedom and was the team lead for the Mobile Field Surgical Team. After his military service, he completed a sports medicine fellowship at Cincinnati Sports Medicine and Orthopaedic Center. He treats all orthopaedic sports injuries and specializes in the latest arthroscopic and reconstructive shoulder and knee surgery. Dr. Walsh is board certified by the American Board of Orthopaedic Surgery. Dr. Walsh, his wife and three boys reside in South Glastonbury. In Dr. Walsh’s spare time, he enjoys family time, children’s extracurricular activities and many sports, including-running, hiking, skiing, fishing and hunting.